The classic Autumn Leaves wooden urn is made for us in the U.S. by expert woodsmiths. Each is individually engraved with a decorative vine along the top of the urn. Genuine hardwood urns offer a natural softness to a home. Available only in Cherry. This urn is accessed by removing several screws and a wood plate from the bottom of the urn. 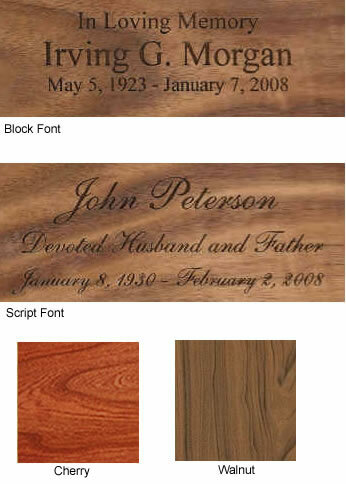 Engraving on the top of this urn is available for those who would like to personalize the urn. We can engrave three lines but due to the border, engraving is limited to no more than about 30 letters/numbers per line. You will not receive an engraving proof so please be sure spelling, punctuation, capitalization, and dates are correct. Normally ships in 2-4 business days. Ships from the West Coast.